LIMA, Peru — Roman Catholic Cardinal Juan Luis Cipriani’s ultraconservative views and cozy relationship with fugitive ex-President Alberto Fujimori have frequently helped snare him in Peru’s tangled web of political intrigues. But even his adversaries were surprised when he indignantly announced recently that he had been subpoenaed to testify in an investigation into the alleged murder of his predecessor, Monsignor Augusto Vargas Alzamora – at the hands of Fujimori’s now-jailed spy chief, Vladimiro Montesinos. “Mister prosecutor, open your mysterious files and say who mentioned me in a fictitious event because everyone knows that the cardinal died of natural causes after a long illness,” Cipriani said during his Palm Sunday Mass. Until Cipriani’s complaint, few Peruvians would have suspected Vargas Alzamora, a liberal Jesuit, was the victim of foul play. Most still don’t. He died in September 2000, four months after suffering a debilitating cerebral hemorrhage that left him bedridden. But Cipriani’s comments and the lurid possibility of homicide have set Peru abuzz. The Lima rumor mill has worked overtime as Peruvians recall that Vargas Alzmora and Cipriani were often at loggerheads over Vargas Alzamora’s strong criticism of Fujimori’s authoritarian methods. During the past decade, Cipriani grabbed headlines with his support of security forces in Peru’s dirty war against far-leftist Shining Path guerrillas. He said in 1991 that most human rights groups were apologists for Marxist and Maoist organizations. 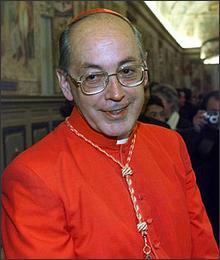 After Vargas Alzamora died, in January 2001 the Vatican named Cipriani, a bishop, as its first cardinal from the conservative Opus Dei movement, outraging political activists and many Peruvians, including some church leaders. In the last year of Fujimori’s regime, Cipriani had, in fact, become critical of Montesinos’s influence. Fujimori has been living in his parents’ native Japan, safe from extradition, since a corruption scandal toppled his government in November 2000. In its own defense, the Attorney General’s Office said it only wanted Cipriani’s testimony because he visited Vargas Alzamora a few days before his death, not because he is a suspect. Bishop Luis Bambaren, an ardent critic of Fujimori’s regime, was also asked to testify, and has made no fuss about it. The investigation was opened after a confidential witness claimed he overheard Montesinos tell a top aide that one of his agents had infiltrated the church and poisoned Vargas Alzamora’s food, an attorney general spokeswoman told The Associated Press. Cipriani’s complaint prompted friends and foes alike to jump to his defense and accuse the prosecutor, Hector Villar, of everything from grandstanding to carrying out a political vendetta for the cardinal’s enemies. Even former Justice Minister Fernando Olivera – himself under investigation for allegedly delivering forged documents to discredit Cipriani – criticized the proceedings. The letters – one supposedly written by Cipriani, and two others by the Vatican’s ambassador to Peru – turned out to be fake. Cipriani charges that the probe of Vargas Alzamora’s death is yet another attempt to discredit him.. This article was also printed in The Wall Street Journal and the Sacramento Bee.